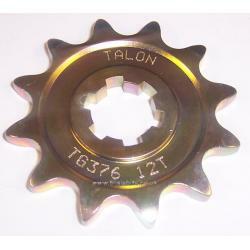 A Talon Gearbox sprocket for the Suzuki RL250 and RL325 models with a 520 chain. The 250 was originally fitted with an 11 tooth gearbox sprocket, and the 325 with a 12 tooth gearbox sprocket. I also have 10 tooth available, if you want to drop the overall gearing. Please choose the correct sprocket from the dropdown.